FINAL in the Celebration Barbie series. 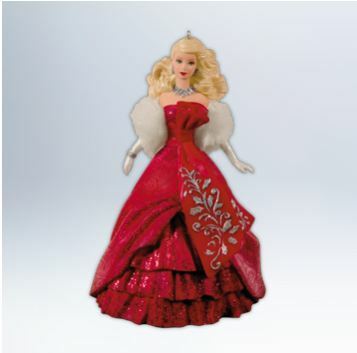 Barbie is elegant in crimson fabric and snow white accessories. Based on the 2012 edition Holiday Barbie Doll. This Hallmark Keepsake ornament is handcrafted and fabric. Size: 2½" x 4" x 2½"